A short video of Ty Page "Mr Incredible" skateboarding from the 70s. In the 70’s Ty Page was known for his handstands, his wheelies and for jumping over cars, but he was way more than that. Take a look at the video at about 2:20 when he rides the giant Free Former Plexiglass ramp. 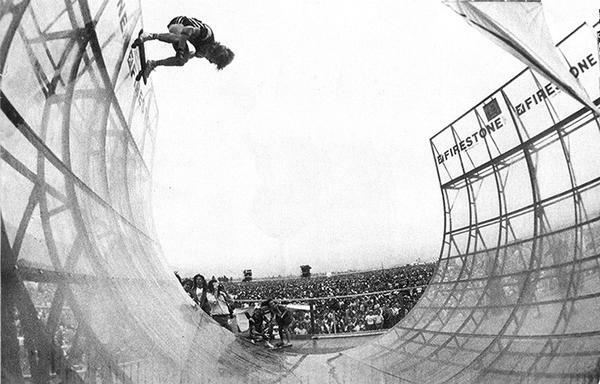 Remember that the half pipes where exactly that in the 70’s: a half pipe. Features bank-riding, high-jump, barrel-jumping, downhill nose-wheelie (manual), and ramp-riding. Ty skated for Makaha, Unity and Free Former. Also features Bruce and Brad Logan.